You are curious about our prices, right? To keep it simple: Group Class $15, Private Lesson $75, Trial lesson Free. Dance with me Toronto offers private, semi-private lessons and group classes in Ballroom and Latin dancing, Salsa and Argentine Tango. Private lessons give you the most flexibility and advantage – custom program and custom schedule, tailored to your needs, goals and pace! Rates: $75 a lesson (+ tax) per person/couple. Group classes are great to learn, practice and socialize. Group classes are offered in 10 week sessions. If you attend multiple group classes you get a generous discount. Rates: $15 (+ tax) per person per class – $150 (+ tax) per session of 10 (drop in classes are available for $20 each, cash only). Check Current Group Schedule. Semi-private lessons work amazingly well for a small group of friends or members of an extended family. You can still customize your program and schedule and get a pretty good deal on your lessons at the same time. Rates: $15 to $25 (+ tax) per person per lesson (based on the number of people – usually 3 to 6 people). Before you sign up for any program, we are happy to offer you a Free trial lesson with a professional instructor. Consider it your orientation session: you can try out some popular dances or dances of your choice and get a better idea of what we have in store for you. If you are getting married and need help to choreograph your first dance, follow this link: Wedding Dance Lessons. We’ll be happy to help you, no matter what level you are at – beginner to advanced, in both social and competitive dancing. We specialize in working with adults. Let’s say if you are in between 18 and 88 years old – you are our potential client! Remember: it is never too late to fall in love with Dance! 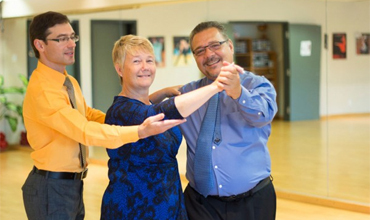 Dance with me Toronto operates at 2 locations in Markham (both in Woodbine & Steeles Ave area). Beautiful and spacious Ballroom Studios with mirror walls and a professional dance floor, minutes from major highways, lots of free parking, accessible by public transit. To check the exact location, please go to Contacts.